Consistency is one of the hardest skills for performers at all levels to develop. Consistency means, at its most basic level, being able to execute the same skill (or skills) the exact same way, every time it's required of the performer. In other words, it's being able to do something right every time you try to do it. It's the "every time" that gets most people – after all, to err is human. Drum corps folks in general don't believe in the concept of human limitations, so we have to try to overcome our own innate tendency to screw up! The old saying goes, "Students practice till they get it right. Professionals practice till they can't get it wrong." Drum corps subscribes to this notion too, obviously, spending dozens of hours on every minute of a show – and to be fair, the level of skill that is demanded by even the most average drum corps show is far beyond what is required to, say, make a left-hand turn in a car or boil water. Because we're executing multiple skills at one time (marching, tossing, listening, watching, playing, performing, dressing, tuning, etc. ), it takes awhile to get it right! My section leader used to say that not making mistakes was simply a matter of committing the energy and attention to doing it right every time. He was right – but that's a pretty daunting idea when you're looking at what a corps show requires! The best way to be consistent is to train yourself right from the beginning. The learning process involves acquiring skills in a manner that allows you to execute those skills without conscious thought. Think of a baby learning to walk – first you learn to balance; then to take a step; then two steps. By the time we're two or three, the processes behind walking require absolutely no conscious thought; they've reached the level of instinct. However, the initial learning process is quite arduous and lengthy, and requires a lot of thought and energy! For most of us, learning something new doesn't require quite so much effort as learning to walk, but it's still useful to use the technique of isolating skills and perfecting each individually. In my experience, the best way to be consistent in the execution of a particular skill is to simply learn it right the first time! It's an amazing idea really, but it's a simple concept that is difficult in execution. Most of us spend many hours unlearning bad habits that crept in during the initial stages of learning our instrument (if I had a dollar for every hour I've spent trying to unlearn a bad habit, I could start my own drum corps). We can minimize this unhappy reality by learning new skills perfectly the first time. And how do you do that, you ask? Slowly. Very, very slowly. This is called error-free learning, or what I like to call the i/o approach to learning: perfect input equals perfect output – i.e., don't learn mistakes! 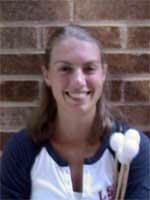 Vida Chenoweth pioneered this approach to learning at least in the percussion world. Chenoweth was a famous solo marimbist in the 1950s. When she was practicing, she would set the metronome, play the piece, and if she made a mistake, she would stop and set the metronome back a click. Only after she could play a piece perfectly at a given tempo would she move the metronome up. 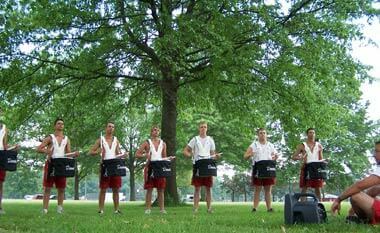 The 2005 Capital Regiment snare section practices with the metronome. This is initially a very time-consuming process and more than a little boring. It requires a lot of maturity and discipline from the performer. However, it pays dividends in the end! You'll be amazed at how quickly your brain is able to adjust to the new information. The first couple of days, you may feel you are making no progress, but whatever skill you're working on will come quickly, and consistently, fairly quickly. The best part is that at every stage, you won't be struggling to just barely get through – you'll have a fair amount of success at every level, because you can't move on until you get it perfect. You'll have to fight a few natural tendencies. For one thing, it's a human desire to test our skills by playing something as fast as we can. It's okay to see how you're progressing by trying something up to tempo periodically, but if you don't have the skills to execute it properly, stop and go back to the slower tempo. You'll just be programming yourself with bad habits. Second, the brain is a muscle like any other. Perfect practice requires a lot of concentration (obviously, the more mentally active and engaged you are, the better it will work), so it's okay to take frequent breaks, especially in the beginning when you're just getting used to practicing this way. If you find your mind wandering, stop and play something else or take a break. The idea is to avoid learning bad habits, and if you're not paying attention, you'll probably end up doing something wrong that you'll unconsciously learn. Third, don't be frustrated when you don't get as far as you'd like to in one day. In my experience, the brain will often process the practice session overnight, and in the morning, suddenly a skill or exercise will be a lot better than it was the previous day. Finally, even once a skill or exercise is learned and you've got it up to tempo, the majority of your time on that selection should be spent in slow practice, to reinforce all the good habits you've developed. If you follow this approach, or something similar, you'll find it much easier to execute the same skill the same way every time. Consistency is key in drum corps. Every player needs to be able to play or spin and march correctly in every situation, not just in rehearsal or in performance. If you are able to develop the habit of not accepting less than perfection from yourself, it will quickly become easy, even routine, to be consistent.